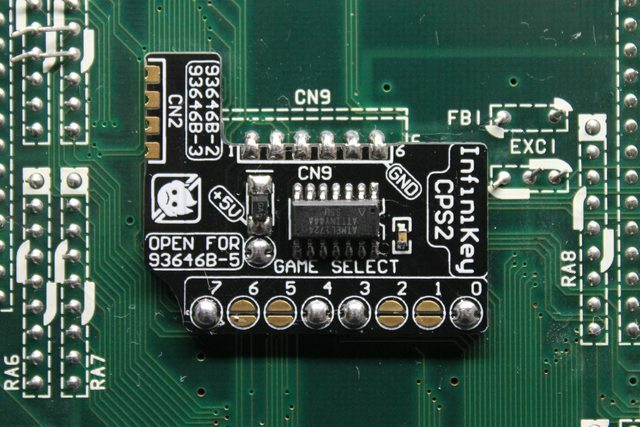 Mini project: InfiniKey-CPS2. Use original game code without risk of battery failure or damage. Injects appropriate decryption key when the game is powered up. Works on all board revisions. 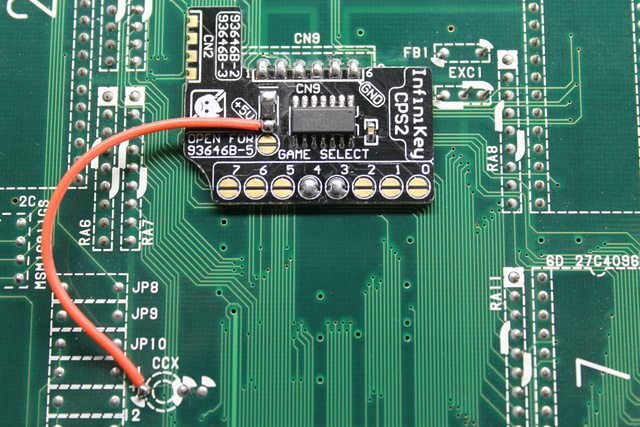 Installation requires only a few simple solder points. And of course, massive thanks to Eduardo Cruz ("Arcade Hacker") for his rigorous CPS2 encryption research and releasing publicly the decryption keys, finally allowing arcade collectors to revive their hardware the same way that Capcom's own coin-op division once did! The post was edited 12 times, last by undamned ( Feb 15th 2019, 10:15pm ). I was just commenting on the other thread about how cool the form factor is in that Twitter video floating around. I think I might need a bulk order. Wow perfect, I was only recently asking about something like this! 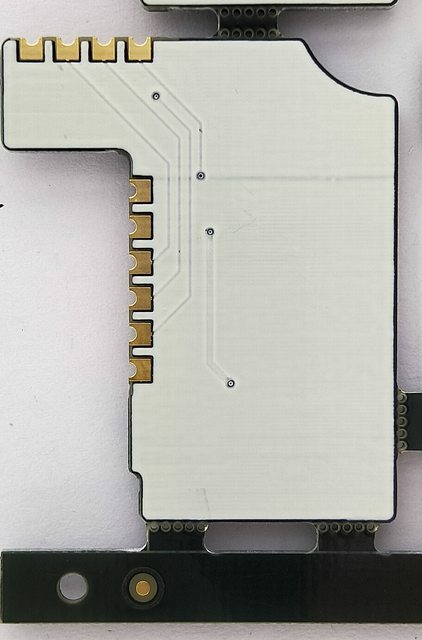 So the game select jumper pads are opened / bridged according to board revision? One key loaded per time, programmed via PIC programmer etc? Wow this is a cool project! Too bad I don’t have any CPS2 boards left besides the multi, otherwise would have tried one for sure! This is a ready to install solution. No programming required. Every key is already inside. I made a manual/spreadsheet with what jumper settings correspond with which game. Just dawned on me that would be how it worked. That's brilliant. I take it that soldering is required for certain board types? Are all supported? Dude. You have a price-point yet? I would use these for every single one of my original pcbs! Cool, is the install via headers not available with this one like the other version from konosuke? Sure you can use the same type of header he did. You just need to observe the proper pin order (mine designed for bottom mounting, so you ether need to mount it upside down or flip it over frontwards to maintain that Pin 1 goes to Pin 1, etc. Would that be an option that you could pre made? The design is to be universal. Not all boards have CN9, so I do not intend on selling them with that. 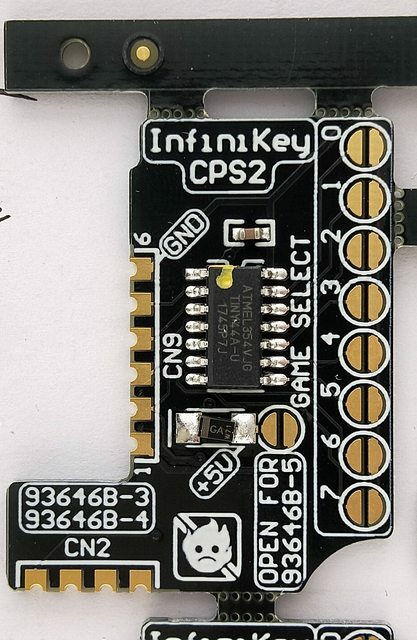 Even if the connector were installed, you still have to set the solder jumpers to whatever game key you need, so no way to avoid soldering in some form. Any plans on making this 'open source'? Would be nice to have distribution possibilies across the globe. I'd gladly produce them here in Australia to cover Australia / New Zealand etc. I can source the parts, program, assemble etc, just need the Gerber files and code. Not to profit from, just to share with as many people as possible as cost effectively as possible. I feel rude asking and won't be at all bothered if you decline, just a thought. Not at the moment. 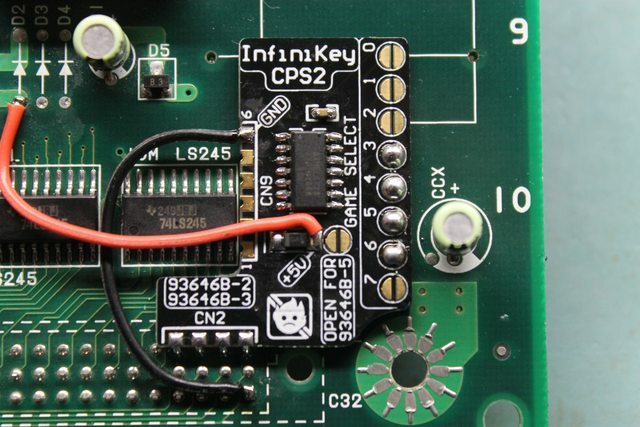 cr4zymanz0r's Arduino Uno fork is certainly the rapid way to disseminate globally. Cheap and already open. Ah ok yeah I wasn't sure if the header is on every board or not. What revisions have the header? You COULD solder a board mount connector to that and plug it into the CN9 connector. Even though it's not intended it would work. Wow, looks like a very neat solution...definitly would buy some of them! Good work man! Excellent price point. I'm definitely interested!